Sleep soundly in peaceful accommodations in the heart of downtown Monterey. 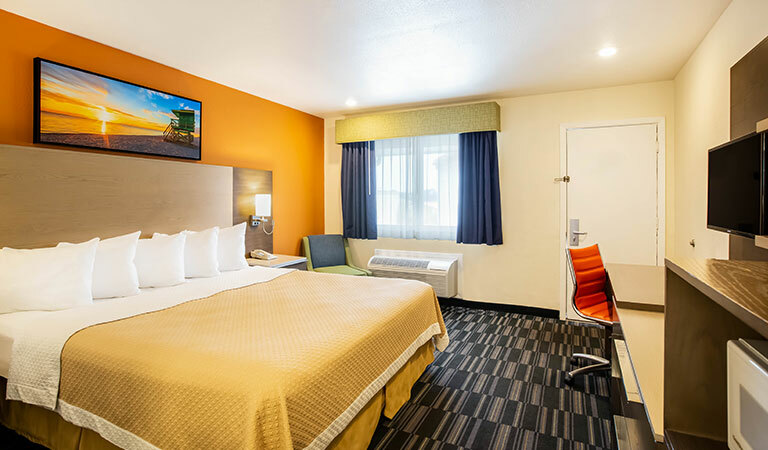 The Days Inn Monterey Downtown offers inviting accommodations to relax, unwind and recharge while staying with us on California's central coast. Each of our 56 charming guest rooms and suites are thoughtfully designed to afford every comfort and feature microwaves, refrigerators, and coffee makers to make yourself at home. 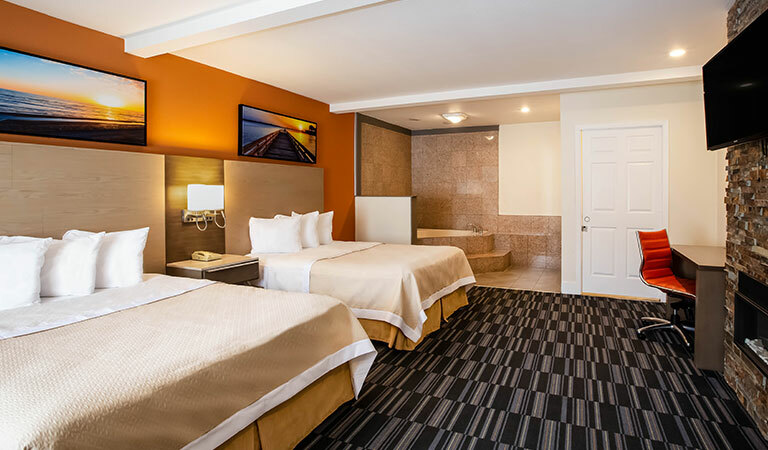 Our Monterey hotel rooms are available with ocean views or choose a spacious suite with a fireplace and a relaxing Jacuzzi hot tub, perfect for romantic getaways. Get a great night's sleep on Simmons Beautyrest pillow-top mattresses or kick back and watch your favorite shows on the flat-screen TV with premium cable. 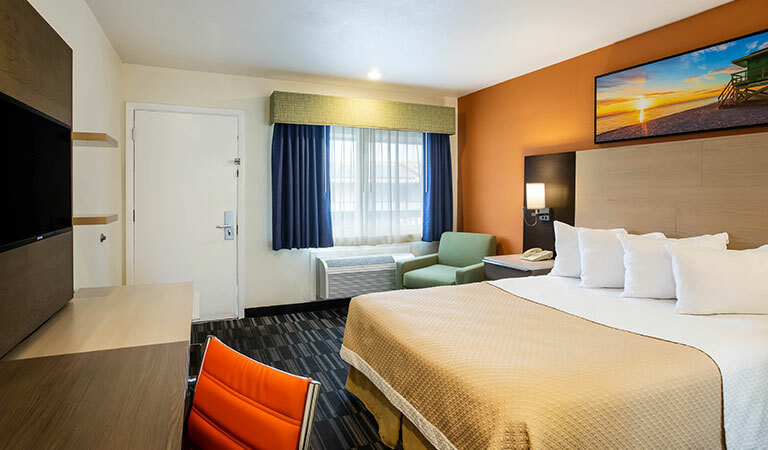 Stay connected with complimentary Wi-Fi and wake up to a Daybreak Breakfast serving freshly brewed coffee, bagels, pastries, fruit, yogurt, and juice. 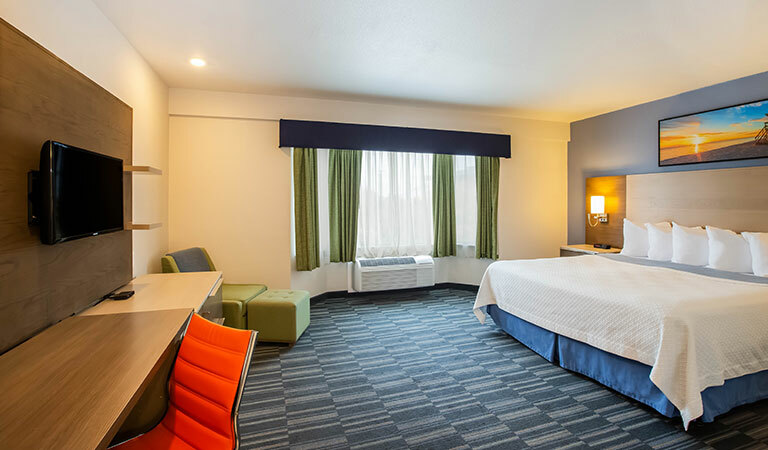 Wake up refreshed in one king pillow-top bed and enjoy all the comforts of home including free Wi-Fi, microwave, refrigerator, flat-screen TV with cable, and a coffee maker. Settle into one queen pillow-top bed and make yourself at home. Enjoy having free Wi-Fi, refrigerator, microwave, flat-screen TV with cable, and a coffee maker for added convenience. 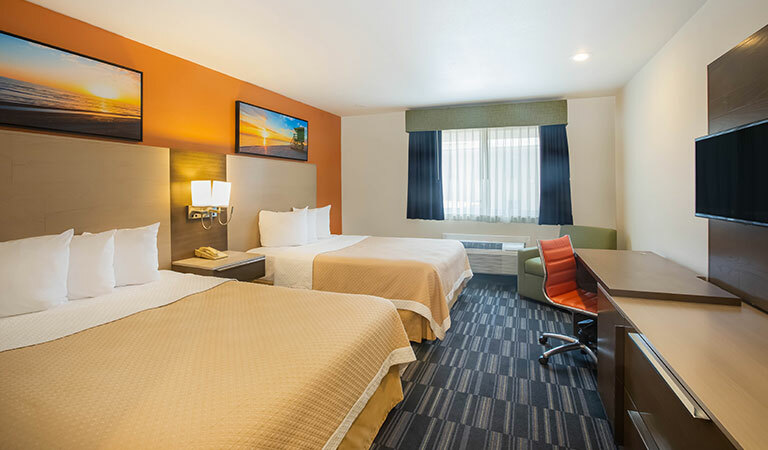 Perfect for families, these spacious rooms are outfitted with two queen pillow-top beds, free Wi-Fi, refrigerator, microwave, flat-screen TV with cable, and a coffee maker. Enjoy breathtaking ocean views from these deluxe rooms featuring two queen beds, a flat-screen TV with cable, coffee maker, clock radio, free Wi-Fi, refrigerator, and microwave. 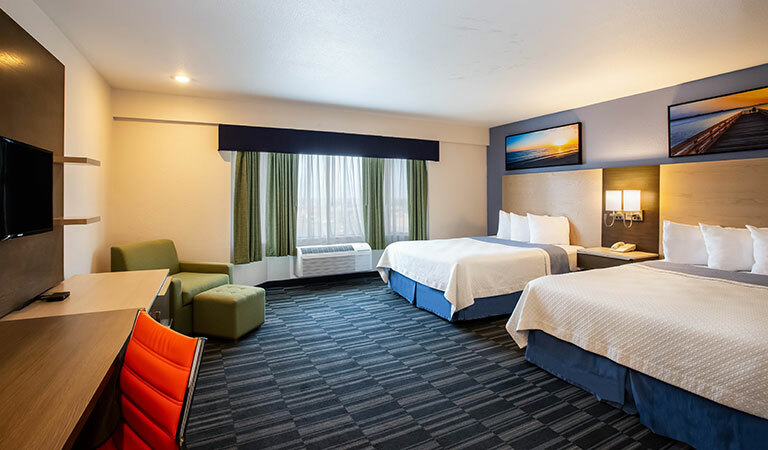 Gaze out onto Monterey Bay from these deluxe rooms featuring one king pillow-top bed, a flat-screen TV with cable, coffee maker, clock radio, free Wi-Fi, refrigerator, and microwave. Enjoy a romantic getaway in spacious suites with a separate bedroom with one king bed, an over-sized couples shower, and a living room with a cozy fireplace, sofa bed, and flat-screen TV. Relax and unwind in these spacious suites with two queen beds and a Jacuzzi tub. 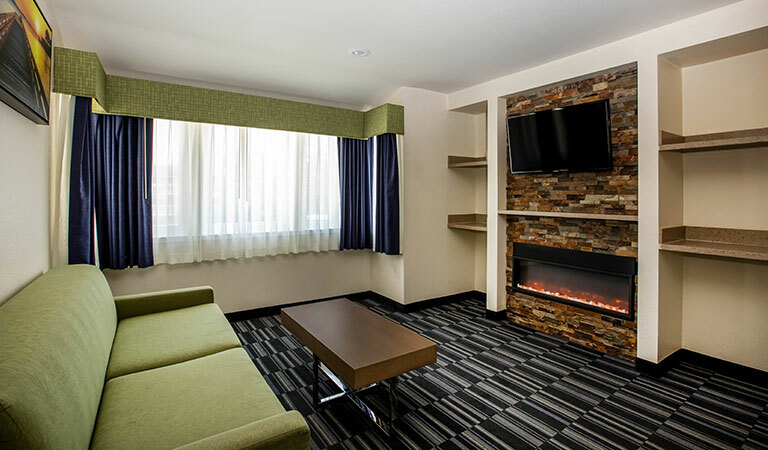 The room also features a cozy fireplace, flat-screen TV's, free Wi-Fi, refrigerator, and microwave.